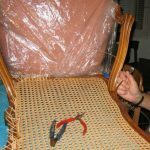 Locate Chair Caning Repair Experts near you to make all types of seat weaving restorations and repairs to your antique, flea market or family heirlooms. 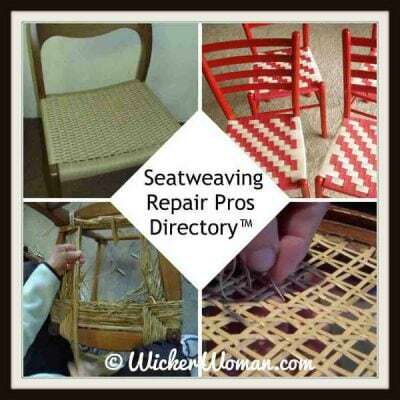 Select your Chair Caning Repair and Seatweaving Experts by State or browse the random listings below. Hank’s Cane & Rush Restoration specializes in Hand Cane, Machine Cane Webbing, Paper Rush, Danish Cord, Shaker Tape and more. Sadly caning and rush seat weaving are fast becoming dying art forms and it is our intent not to let that happen. Each chair we see in the shop comes with a story or has a story yet to come! Saggy Bottom Girls Caning offers chair seat weaving services in and around the Indianapolis, Indiana area. We specialize in cane, fiber rush, seagrass, flat reed, binding cane, and others. 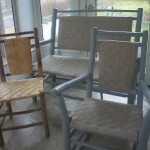 We are a home-based family business and I personally weave each chair. 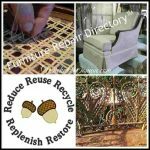 We also work with local restoration companies should your chair need structural repairs. I started this business several years ago as a way to spend time with my dad. People began asking me to fix their chairs with saggy bottoms and that is how the business began. This is also how I came up with the name. It’s a play on the movie “O Brother, Where Art Thou?” starring George Clooney, and my Saggy Bottom Girls Caning seemed like an interesting twist to their Soggy Bottom Boys band. 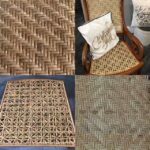 Barbara’s Caning and Weaving, also known in the region as Broward Furniture Refinishing & Caning is located in Fort Lauderdale and has served Broward County and the surrounding area over 25 years, reweaving chair seats. 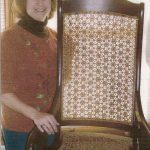 Owner Barbara Marx, started weaving many years ago when she needed her own four chairs re-caned. 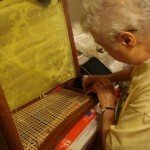 She was living in New York City at the time, in the 1980s, and decided to learn the chair caning craft on her own. 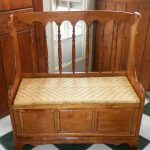 Barbara liked caning so much that she later went into the seat weaving business, providing services of hole caning, pressed cane webbing, paper rush and repairs to wicker furniture, too. Always up for a challenge, not only do we work on chair seats, but also love seats, benches, and even cabinet doors on yachts! Our services also include repair and re-gluing of chairs. We do work for several local antique dealers in Florida and New York, too. Call or email today so we can discuss your chair caning needs. Then we’ll set up an appointment and give directions to our shop! 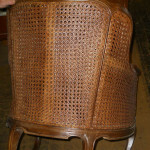 At Big G Furniture Repair & Chair Caning in Tyler, Texas , wood furniture repair and caning is our specialty. Does your furniture need TLC? Has your caned or rushed seat fallen apart? Whether your piece requires major repairs or simply a good cleaning, give us a call or send an email, we’re here to help. In Walnut Hollow, found in the countryside of Southeast Tennessee, lies the quaint workshop of April Greer, a self-taught craftsman with over 20 years experience in the repair and replacement of many seat patterns and weaves, including rare and specialty patterns. April is a practitioner of many heritage arts, including natural basketry using materials she harvests and prepares, and believes in honoring the past and passing on what she has learned by teaching classes. April prefers to fix an aged chair rather than throw it out and looks forward to helping preserve a part of your history. Jeannie’s Chair Caning Shop formerly of upstate New York (2012) and now restoring chairs in Virginia, has 40+ years experience in furniture restoration and seat repair. Home-based location offering expert work in hand caning, blind caning, pressed cane, rush, splint, Danish cord and specialty weaves. Also offering some furniture repair and refinishing. With pick-up and delivery available in the Virginia Beach, Chesapeake, and Norfolk areas. Customer base extends from as far as Maryland, Richmond, Outer Banks and Eastern Shore of Virginia. 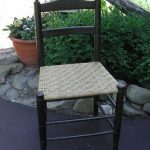 Murray Hill Weaving, is a chair bottoming specialist using cane, pressed cane, hickory bark, splint, and Shaker tape – emphasizing patterns that match the style. Also offering basket and wicker furniture repair, basket & seatweaving classes and retail caning and basketmaking materials. I’ll restore items or teach you to do it! Located in central New Hampshire, we’re inviting you to visit and stay a while. 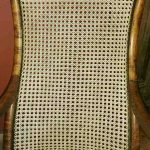 BLACK SWAMP SEAT WEAVING, LTD.
Black Swamp Seat Weaving, LTD, chair caning repair expert is located in NW Ohio in Perrysburg. 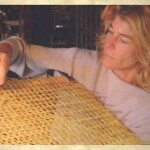 For over 35 years owner Carrie Weiss has done all forms of chair seat weaving from hand caning to wicker repairs. She was taught to weave at age 15 by her grandmother who instilled the value of olde-world craftsmanship. Custom work, reasonable pricing, pick-up, delivery available. Reddick Family Chair Caning–Was started in 1974 by Imogene Reddick and was one of only a few commercial seatweavers left in Oklahoma City. Imogene provided PEG, HOLE, PORCH and SET-IN CANING and RUSH seat weaving services to customers in the greater Oklahoma City area and beyond. Imogene also taught several members of the family the various techniques and designs, so they too can keep this craft alive and flourishing. At the ripe old age of 95, Imogene decided to retire, but her daughter Dianna LeBoeuf and husband JD, assumed the business and moved it to Bethany, Oklahoma, continuing the legacy. Chair caning expert Helen Cribbs, owner of Chairs Caned in Springfield, OH provides experienced and fair priced handwoven and pressed cane, plus wide binding cane in several patterns. (I now refrain from taking on wicker & fibre rush). I have been in this business for over 25 years. And since I work from home my pricing stays reasonable. When possible, I offer pick-up and delivery within a reasonable distance from my shop. Several furniture refinishers and upholsterers in Dayton, Columbus, and Tipp City, Ohio keep me busy honing my craft. 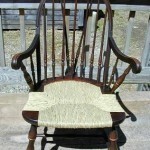 Visit my website where you will find several patterns for the DIY chair seat weaver. The 7-Step Strand Caning pattern is especially detailed with diagrams. All are free to download and use. Martha’s home-based business, Briar Creek Studio is located in the Upper Catskills of the Southern Tier of New York near Oneonta. She has over 25 years of experience teaching and offering all types of chair caning, rush, splint and Shaker tape seat repair. Work is of professional quality and prices are reasonable. Free estimates. Call or email for hours, prices and possible pick-up. 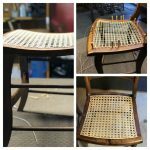 Two shops in one–The Chair Man specializing in antique chair restoration; chair caning, fiber and natural rush, splint, Shaker tape and regluing the joints of chairs. The Tea Lady specializes in antique and vintage porcelain, pottery and glassware. Over 20+ years of seatweaving experience and service. Pickup and delivery available for local Boston area. Keeping wonderful (sometimes very old) chairs in use and circulation is our goal. We love the stories of how many chairs have been handed down within families or found on the side of the road. Visit our website, see our work samples and us at antique shows! RS Peck offers caning, both hand woven and prewoven, in most patterns including the very difficult double-blind cane technique. I also do woodcarving of reproductions (such as missing sections on furniture and mirror frames) and original pieces. 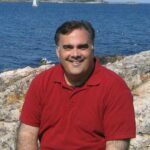 I owned and operated a furniture restoration business in Racine, Wisconsin for 24 years, prior to closing in 2014. So if your piece needs gluing or repair, as often is required with chairs and rockers, I do provide that service. Bayberry Seatweaving, headquartered in Canton, MA is an experienced home based seat weaving business serving the Boston area and Martha’s Vineyard. Services include cane, rush, and pressed cane in addition to re-gluing and refinishing. Pickup & delivery available. 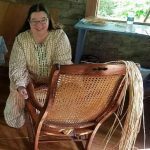 Lauren’s Chair Caning, a home-based seatweaving business, has been restoring and repairing cane and wicker furniture in the Dubuque, Iowa area since 1979. Specialty weaves include hand-caning, pressed cane, French or blind cane, rush, Danish cord, and splint reed. Lauren also offers some minor furniture repairs and gives FREE repair estimates. Call or email today to schedule your appointment! 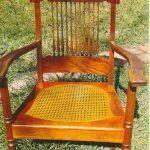 Jan’s Chair Caning & Wicker Repair is a home-based business owned by Janet Noall, with over 40+ years experience in ALL TYPES of chair seat weaving, wicker furniture repair, and basket repair. Want to learn how to cane chairs yourself? Jan also teaches FREE chair caning classes through the Park and Recreation Center in Cuyahoga Falls, OH on Mondays from 9 a.m.- 2 p.m.
Make an appointment today to get seatweaving TLC for your precious possessions today or to find out more about the FREE chair caning classes so you can DIY and learn from the pro! 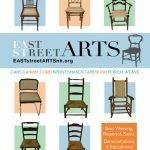 East Street Arts is dedicated to fostering the creation of art through artisan training programs, workshops and community interactions for persons of all abilities. The Association of Artisans to Cane, a chair caning studio at East Street Arts, students learn many different styles of seat weaving and use these skills to restore chairs for community members. Caning students are trained in the craft of chair seat weaving through hands-on learning and with oversight from a Master caner with over 30 years of experience. The caning students have the opportunity to learn various forms of seat weaving, including hand cane, pressed cane, paper rush and flat reed/splint weaving, as well as other techniques. Caning students advance at their own pace; as one style of caning is mastered, another style is taught. While most of the seat weaving is done to restore chairs for community members, donated chairs in good condition are also restored and sold in the shop. 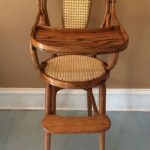 Rick’s Wood & Wire, a family business offers chair caning and seat weaving services as well as 30+ years of full-service professional furniture refinishing and repair. Located in northwest Ohio in Pemberville, servicing northwest OH and southeast MI. Pickup and delivery are available. 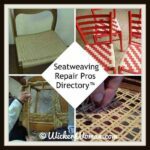 Diana, owner of Sit-A-While Seat Weaving has over 30 years experience offering custom chair seat replacement using cane, splint, fibre rush, Shaker tape and seagrass. Pick-up available within a 75-mile radius. Diana travels throughout Missouri demonstrating at events and also offers weekend classes. Stay at local B & Bs in the historic community overlooking the Missouri River. Charter and Cottage Member of The SeatWeavers’ Guild, Inc. ®.